I stumbled on this Flattracker when I lived in Richmond in early 2007. It belonged to Rusty Gross, local collector and historian. Fortunately, he was ready to sell. I purchased the bike for Scott – a token of appreciation for all the support he gives to our organization. 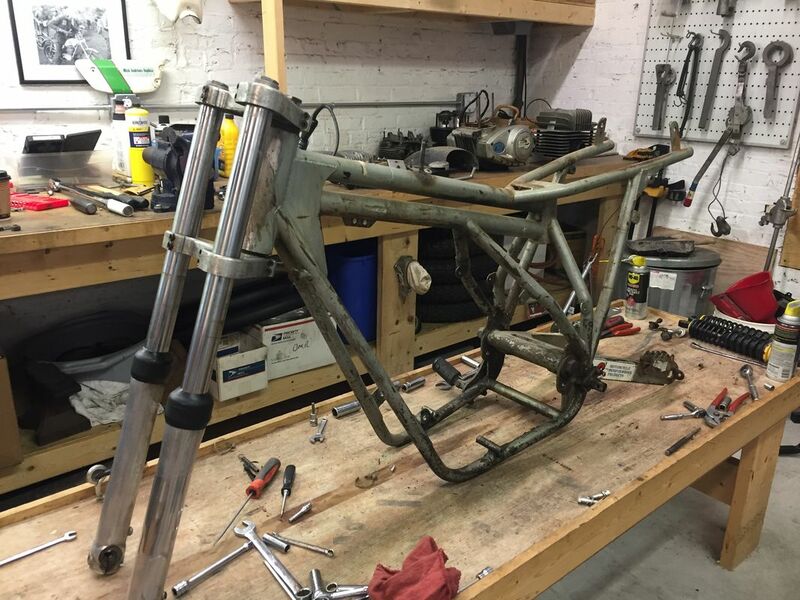 We enjoyed the “right off the track” look for the last 10 years but it’s finally time to restore the chassis – with help from Dave Larrabee, Steve Dance and Malcolm Doying, and rebuild the KTM 250 engine in our shop. We were able to obtain the original Carlisle tires, and the body work repairs and paint work were completed several years ago. It’s gonna be a great looking bike. Several were sold back in the day by our local dealer, Motor Sport Center. Tim Taylor and Randy Streett were two owners that I knew of.